When you think of Italy, you perhaps associate it with its most famous attributes. Maybe you picture Rome’s Colosseum, the Vatican’s Sistine Chapel or Florence’s David. For most people, Italian food also figures when they picture Italy in their mind. The reason Italian food is so memorable is because of the fantastic home-grown, natural ingredients. Principal amongst these is Italian olive oil. At Avventure Bellissime – the Italian tours and Italian holidays expert – we regularly visit olive groves with our guests. So we asked our compatriot olive growers for their best facts about Italian olive oil. 1. The Olea Europaea, or the Olive Tree came to Italy around 1,000 years ago. The Olea Europaea is the tree or shrub that produces olives used in olive oil. It is native to the Mediterranean, Asia and Africa although hasn’t always been prevalent in Italy. We think the Greeks brought the tree to Italy around 1,000 BC and from there it flourished. 2. 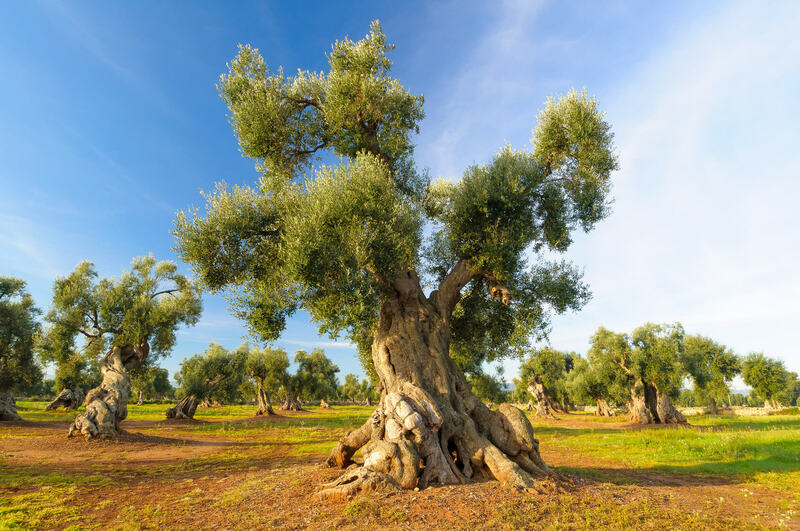 The Olive tree can live for up to 2,000 years. One of the most fascinating olive oil facts was that the tree could live for 2,000 years. It’s a very resilient tree that withstands difficult climates, particularly warm ones, very well. 3. There are different grades of olive oil. Firstly there’s extra virgin olive oil which is the most pure and of the best quality. Then there’s virgin olive oil that is made using riper olives than extra virgin olive oil, but is created using a similar process. Then there’s pure olive oil and this is a blend of refined and virgin olive oil. It is lower in quality and doesn’t have anywhere near the same amount of anti-oxidants. 4. There’s a special process that differentiates extra virgin olive oil from other varieties of olive oil. Extra virgin olive oil is the ‘highest’ quality olive oil that you can buy. There are restrictive requirements that surround the production of extra virgin olive oil that differentiate it from regular olive oil. The oil is extracted within 24 hours of the olive being picked and at a lower temperature (27 degrees Celsius). The oil is then extracted by mechanical cold pressing alone and bottled immediately. This is because any oil produced after the first mechanical pressing loses quality, has less vitamin E and antioxidants and more acidity. 5. Olive oil is sensitive to light. Light can have a detrimental effect on olive oil. That’s why it is stored in dark green or brown bottles. If olive oil is exposed to light, the anti-oxidants are destroyed. It needs to be stored in a dark cabinet at room temperature. 7. Olive oil can have a positive effect on your health. One of our favourite facts about Italian olive oil is that regular consumption of extra virgin olive oil can decrease and maintain a healthy blood pressure. Olive oil contains monounsaturated fatty acids and they can help protect against heart disease and cancers. You can use olive oil in your bathwater to help your skin – apparently the actress Sophia Loren did this regularly to achieve softer skin. If you use a few drops on wet skin, like your face, until absorbed, then it acts like a moisturiser. 9. Its versatility doesn’t stop there. Some people use it as a hair product. You can even use extra virgin olive oil in your hair to protect it against the effects of heat styling products. The United States of America. Italy exports more Olive Oil to the USA than anywhere else in the world. So, if you love Italian products and Italian food, why not come and visit Italy and experience them at source! At Avventure Bellissime – the Italian tours and Italian holiday expert – we offer a number of wine and food tours in Italy where you can visited the countries most celebrated wineries and the best local cuisine – cooked with the very best olive oil, naturally! If you are thinking about taking an Italian vacation, then please do visit our website at tours-italy.com to find out more about our tours of Italy’s fabulous city’s and sights as well as our Italian vacation packages. Also, if you are looking for some travel inspiration be sure to check out our other blog posts at tours-italy.com/blog/ It’s a great read about all things to do with Italian holidays– like following in the footsteps of Romeo & Juliet in Verona, insights into Rome’s Colosseum and the Spanish Steps, how to save money when visiting Italy, the must see sights in Venice as well as why you should consider visiting lesser well known cities like Bologna. It’s a great read about all things Italian and Italian holidays!